Posted December 9, 2016 by The Rapid & filed under In The Community. It’s time to think small this holiday season. While Small Business Saturday may be behind us, you can still make an impact in your community by shopping at small businesses this holiday season. If you have holiday shopping to tackle, we suggest visiting local businesses to find something special for everyone on your list–and maybe even something for yourself! We spoke with Anthony Puzzuoli of Local First to learn more about the impacts of local shopping habits and Local First’s Holiday campaign. According to Local First, when you spend money at a locally owned business, nearly 70 percent stays here in the community. When you spend at a national chain, only 40 percent of the funds stay local. Shopping local allows you to positively impact the local economy, create jobs, engage with your community, and receive a completely personalized shopping experience. Even if you’re only getting one gift a year from a small business, you’re making local reverberations. We suggest kicking off your local holiday shopping spree by visiting Art of the Table, located at 606 Wealthy Street SE. The storefront is just steps away from the Route 5 bus stop at Wealthy and Union and a short walk from Route 4 at Eastern and Wealthy. This beloved specialty gourmet shop has a carefully curated selection of gifts for foodies, beverage enthusiasts, and entertainers alike. There’s something in this shop for every adult on your list. The friendly, knowledgeable staff can even help you in finding the perfect present for the harder to buy for individuals on your shopping list. Amy Ruis, Owner of Art of the Table shared what holiday shoppers can expect while shopping at Art of the Table this month. “Art of The Table is open until 9 p.m. every Thursday in December with wine tasting taking place from 4-8 p.m. In the store every day, customers can try samples of products before they buy and have their gifts wrapped gorgeously in store,” Amy Ruis, Owner of Art of the Table. 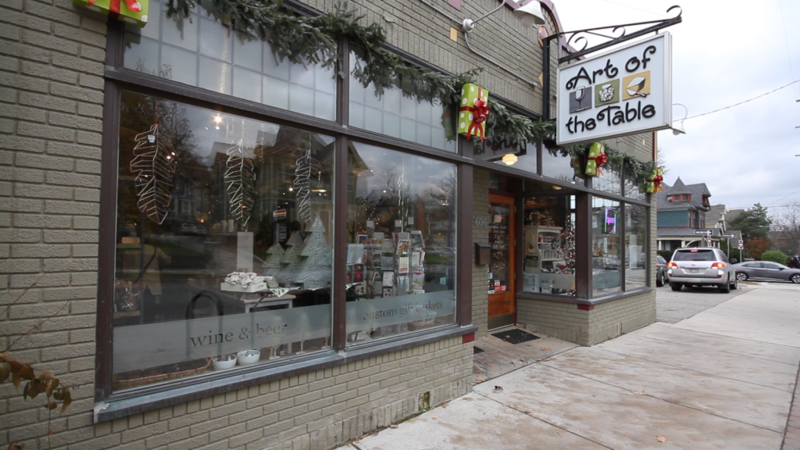 Art of the Table is just one of many small businesses participating in the Local First Holiday campaign. Some other participating businesses include 6.25 Paper Studio, Conscious Collective, Post Petals, Happy Michigan, Old World Olive Co., and many more. You can plan your holiday shopping trip to local businesses by visiting ridetherapid.org and planning your trip or finding stops near your destination. Interested in getting involved with Local First as a member? Learn more about joining here.